Ever since the announcement of title, Naga Chaitanya starrer Savyasachi has grabbed special attention. Savyasachi (Ambidexter) is one who can use his both hands with equal power and skill. Similarly, Chaitanya will have skill of using both the hands in the movie. Savyasachi is progressing at brisk pace. 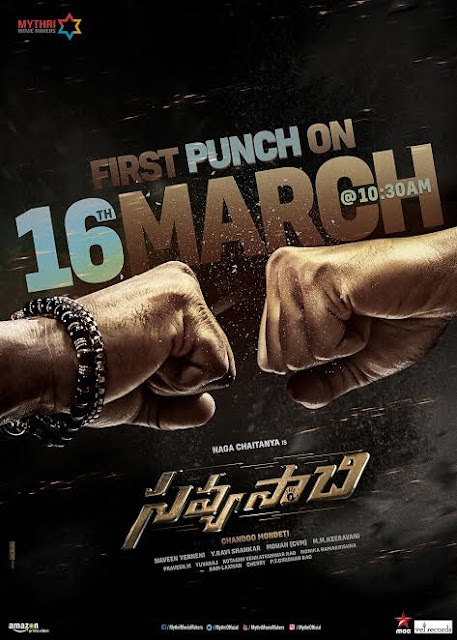 The 'first punch' of the movie will be blown on March 16th at 10.30AM. Apparently, it will be a glimpse of what the movie has to offer. Chandoo Mondeti is directing this concept thriller. Having delivered romantic hit 'Premam', Chaitanya teaming with Chandoo has raised expectations on this film. Madhavan is playing a key role in Savyasachi and Bhumika will be seen as Chaitanya's sister. MM Keeravani is composing music. Mythri Movie Makers is bankrolling the project.